Locking in a profit is one of the advantages of using Bet Angel. With multiple tools to enable you to quickly and easily lock in profit and 'cash-out' of a bet before the final whistle, chequered flag or first horse past the post. Win whatever the result with Bet Angel. Bet Angel has had the ability to cash-out of your bets since it was first launched in 2004 and currently offers many ways to cash out your bet. 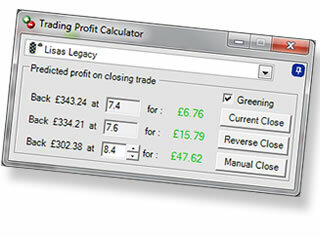 You can even ask it to automatically cash out if you reach a certain profit target. Cash out on all sports, even those not where cash out is not offered by Betfair. 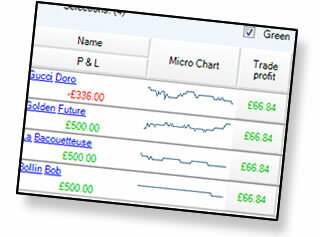 The one click screen features the cash-out column. This shows your position should you wish to cash out all your bets at the current prices. Quick and easy. This is very similar to the cash-out feature offered with Betfair and will place a bet in the exchange for you automatically calculated to realise profit. 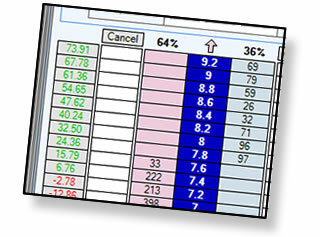 Bet Angel features a suite of easy to use profit calculators. These allow you to cash-out on individual bets and see your positions at various prices giving you greater control of your cash-out options. If you are a traditional trader and prefer using a ladder-style interface then Bet Angel provides you with a more powerful ladder cash-out column. This tool shows your potential position at prices a few steps away from the current prices allowing you to make a judgement on your risk and where you would like to cash-out. Try Bet Angel for Betfair for a month for only £15 or FREE for fourteen days. *Terms and conditions of trial period : Offer is limited to only one trial per person / per Betfair account and subject to availability and non concurrent trials. We reserve the right to refuse a trial period. Limited offer only.